Our Lady of Fatima asked us to pray a Rosary daily. We don’t always have one with us, but we generally do have our cell phones. So why not get a rosary re-imagined for that screen of yours? 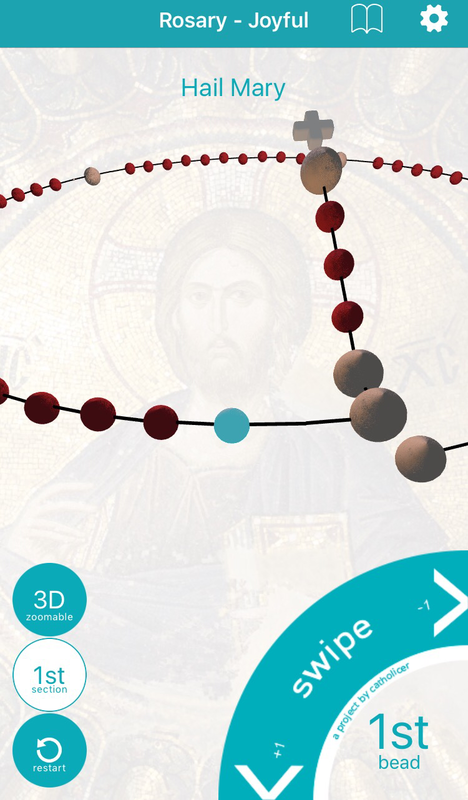 Catholicer Beads (Free) Apple re-thinks the digital rosary experience with its elegant 3-D animated user interface and thumb swipe operation like no other rosary app out there! Give it a whirl. Features: vibration at Our Father breaks (Rosary praying needs some tactile markers); text option (explanations of the mysteries you’re reflecting on); chaplets options (for more prayer experiences); option to change background picture (to customize your meditation focus); two viewing options (really cool 3-D or static full Rosary.) Biased to right-handed iPhone users, but hopefully that will change with updates. I’m sorry, but there are much better rosary apps out there. The app has spacey effects, but doesnot even display the texts or the mysteries. I would suggest Rosary Deluxe or iRosary. I thought I would give their other app “Liturgia a shot and it will not even run on my iPad.